If you know your notation software, you'll be aware that, for the past few years, the team responsible for developing six major versions of the highly-respected Sibelius have been working on a completely new scoring application for Steinberg. We now know that this will be released in the fourth quarter of 2016 and go by the name of Dorico. What's more, it promises the "perfect combination of power and simplicity". With the feature list starting to take shape, we're told that Dorico will have a single-window interface and offer the most flexible note input and editing functionality of any scoring application. Users will be able to work entirely in open meter or freely rebar existing music, and work with an unlimited number of staves and movements, sections or pieces within the same project. It seems that a lot of emphasis has also been put on the presentation of your notation, with Steinberg saying that "Dorico aims to fulfil the aesthetic demands of the most discerning engravers and publishers, providing extensive capabilities for graphical tweaking and editing". What's more, there's every chance that the software will sound as good as it looks, shipping with a range of VST instruments and effects. These will include HALion Sonic SE and the entire HALion Symphonic Orchestra Library. Steinberg's Product Marketing Manager, Daniel Spreadbury, commented: "After working on Dorico for more than three years, we are excited to finally announce its name and forthcoming availability. All of us on the Dorico team are dedicated to be building the best, most beautiful and most useful tool for working with music notation, and we will continue to work hard over the next few months to refine the application before the first version is available for everybody to try for themselves. "This is just the beginning of the journey, and we look forward to working with our user community to continue to shape Dorico into the ultimate tool for composing, arranging and publishing music." 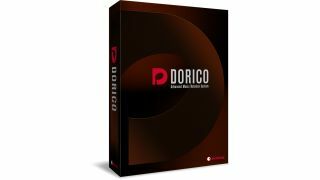 The full version of Dorico will cost €579 for PC and Mac, while the educational price for teachers and students will be €349. Those wishing to crossgrade from Sibelius or Finale will be able to do so for €299 for a limited time. Find out more on the Steinberg website.